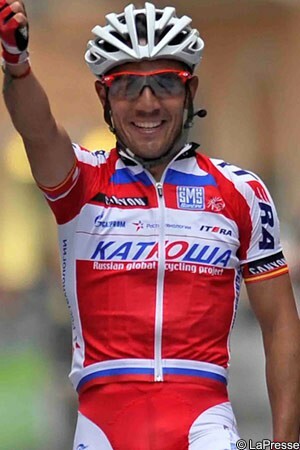 Powering ahead inside the final kilometre and a half and proving once again that he is one of the very best riders in cycling on short, sharp, steep climbs, the 2012 WorldTour champion Joaquim Rodriguez clocked up victory today on stage five of Tirreno Adriatico. The Spanish Katusha rider blasted clear in the streets of Chieti and quickly opened a gap over the others in the leading group. Bauke Mollema (Blanco Pro Cycling Team) and Alberto Contador Velasco (Team Saxo-Tinkoff) led in the chasers eight seconds later, with Mauro Santambrogio (Vini Fantini-Selle Italia), Chris Horner (RadioShack Leopard), Chris Froome (Sky) and Vincenzo Nibali (Astana) completing the top seven. “I'm very happy about this performance. It was very important both for me and for the team, since it's the first in a World Tour race,” said Rodriguez, appearing to refer to the team’s original refusal for a WorldTour licence by the UCI. “I remember very well the final part of this stage and its incredibly tough stretch. We were very careful from the beginning to the end, because we knew it was very difficult to win here in Chieti: everybody was expecting something from me, they know these finals are my speciality. Overnight race leader Michal Kwiatkowski (Omega Pharma-Quick Step) remained with the group until the final ramps towards the finish line, but finally cracked under the pace set by Froome’s Sky team and lost contact. He trailed in over 40 seconds behind Rodriguez and dropped to fourth overall; Froome took over the race leader’s blue jersey. Contador picked up a time bonus for second on the stage and also for taking an intermediate bonus just 4.6 kilometres from the line, on the short but steep ramp of Pietragrossa. He reduced his deficit to Froome to twenty seconds, but still has a lot of work to do if he is to win this race. Ditto for Nibali, who is also on the same time deficit after today’s stage. Time trial specialist Kwiatkowski is a further four seconds back and while he said that he hopes to perform strongly in Tuesday’s concluding TT, Froome’s ability against the clock will have the Sky team feeling confident at this point in time. Tomorrow’s stage lacks the big climbs of the past two days, but is lumpy and will be demanding on the riders. The attacks will continue, with much left to race for. After yesterday’s summit finish finale, today’s last few kilometres had nothing like the same altitude, but the steep ramps were certain to break things up nonetheless. Before then, the 230 kilometre stage would feature two major climbs, namely the Forchetta di Palena and the Passo Lanciano, and it seemed likely that a break would go clear early on. So it proved, with a nine man group racing ahead twenty kilometres after the start in Ortona. Those intent on building a buffer over the peloton were former Giro d’Italia winner Damiano Cunego (Lampre Merida), Juan Antonio Flecha (Vacansoleil-DCM), Cesare Benedetti (NetApp-Endura), Valerio Agnoli (Astana), Michael Schär (BMC), Katusha’s Maxim Belkov, Sebastian Langeveld (Orica GreenEdge), Stijn Devolder (Radioshack-Leopard) and Oscar Gatto (Vini Fantini-Selle Italia). The break quickly got 26 seconds, then this rose to six minutes by kilometre 50. Before then, Benedetti got a corner wrong, lost contact with the move and went back to the bunch. The remaining eight riders continued to work well together and by the time Cunego led Flecha, virtual race leader Agnoli and the rest over the Forchetta di Palena, they were eight minutes fifteen seconds up. The lead then started to swing the other way, dropping due to the chasing being done behind by Omega Pharma Quick Step, Team Sky and Cannondale. Cunego was feeling good and, with the gap falling under seven minutes, knew that he was best to go it alone on the next climb, the Passo Lanciano. He attacked approximately 49 kilometres from the line and gradually hammered out a lead over the fragmenting break; at the top, he was 36 seconds clear of Devolder, his nearest chaser, and approximately three minutes in front of the peloton. From there forty kilometres remained, much of it downhill, and he knew it would be difficult to stay clear. He did what he could, riding flat out, but ten kilometres later was just a minute and a half clear. Team Sky continued to chase; with fifteen kilometres remaining he was a minute ahead, and he was finally recaptured with 6.7 kilometres to go. Sky kept the pressure on and this pace-setting saw off last year’s stage winner, Peter Sagan (Cannondale), who cracked suddenly six kilometres from the line on the drag of Pietragrossa. There were time bonuses for grab at the top and there Contador outsprinted Nibali and Froome to pick up maximum seconds. Very soon afterwards Contador’s team-mate Roman Kreuziger blasted clear with Movistar’s Andrey Amador, opening a lead of several seconds on the descent. However they were brought back on the final climb and heading into the final kilometre and a half, the leading group was back together and racing for the win. Rodriguez made his move approximately 1.4 kilometres from the line, and immediately got a gap. He blasted home for his second victory of the year, following on from his success on the Green Mountain stage of the Tour of Oman. The time bonus and seconds gained moved him from tenth to seventh overall, but the most significant GC development was Kwiatkowski’s cracking and Froome’s successful bid to take over the blue jersey. His advantage of twenty seconds is a solid one, but he faces two more days of hard racing before he can lay claim to the second big stage race victory of his career. He’s sounding confident, though. “It’s a great position to be in – defending,” Froome said. “I’d rather be doing that then trying to gain time over some one. But tomorrow I’m expecting them to throw everything at us. I think the weather is going to take a turn for the worst too. The course is up and down all day so it’s not going to be easy for us.